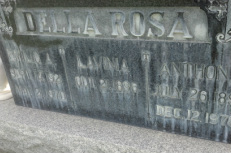 We offer engraving for on-site applications, including adding memorial dates at the cemetery, additional inscriptions, or engraving signage for your home or business. Even if the stone was made elsewhere, you can be confident that your memorial will be completed to perfection by our skilled engravers. Please click the link below to visit our website dedicated to this service. These memorial engraved bricks are a popular fundraiser item for a variety of organizations, we are able to offer these at a very fair price with bulk discounts available. Contact us for a quote! Unfortunately this region's hard water supply can leave your beloved monument looking rather tired. We offer cleaning services and usually are able to make a very dramatic difference. Leave the dirty work to us!